PIM Premium customers can now share settings amongst your team. To take advantage of these features we require your iPad to be running PIM v3.5.0 and iOS 11 or later and have a strong WIFI connection. Follow this helpful guide if you are not running the latest. You have been working with the PIM Support team on preparing a new custom developed Settings File and need to download the Settings onto all your devices in your office. Please note that as part of the process of Sharing Settings you might be prompted to Restore All or Merge. A Restore All should only be performed on new iPads or those wanting to start afresh with complete new Settings and no Inspections. Using Restore All, will remove all existing Settings and Inspections from your iPad so please be careful in using this. If you want to share Settings amongst your the property managers in the office, consult them and work out which Inspection Areas/Sub Inspection Areas, Property Profiles and Shorthand Words you would like to be shared and have consistency throughout your office. 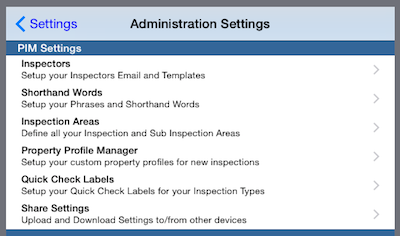 Nominate one device and enter the Inspection Areas/Sub Inspection Areas, Property Profiles and Shorthand Words in PIM Settings. That's it. Your PIM Settings are now available to be downloaded onto other iPads in your office. A list of Settings show now be displayed. If a property manager from your office (or yourself) have just performed Step 1 on another device, then a Setting file should be listed showing the Device and Property Manager/User of the user who uploaded that Settings File. Select that File (so it is ticked) and tap Continue. If you have previously contacted PIM Support and have had a Settings File (either Residential or Commercial) prepared for your office, select the file/entry titled Remote Setup (so it is ticked) and tap Continue. You are now prompted to Restore All or Merge the Settings from the Settings File/Device just selected with those on the iPad you are now using. A Restore All should only be performed on new iPads or those wanting to start afresh with complete new Settings and no Inspections. Using Restore All, will remove all existing Settings and Inspections from your iPad so please be careful in using this. Merge Settings is safer as it will attempt to merge your existing Settings with those Settings just selected. That's it. Your new PIM Settings show now be available to use in PIM!